For a considerable period of time it was the biggest Kolkata joke. Kolkata will be another London and Sunderbans will provide the experience of African safari. After Mamata’s promise during the swearing in of the members of Gorkhaland Territorial Administration, people have now started joking that Darjeeling will become Switzerland. But it was no joke at all. The CM of West Bengal looked quite serious when she promised to make Darjeeling Switzerland in the swearing ceremony of the GTA members. 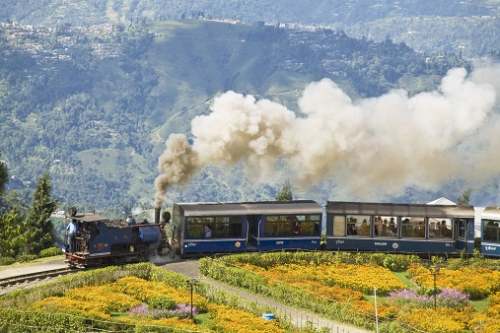 Destination Darjeeling Project is no longer a myth. Infrastructure and tourism development among others, would be the priority areas for her Trinamool Congress-led government. There are many in the state to take potshots on Mamata Banerjee by saying that Switzerland is not one city and the entire hills had to be developed if her dream of turning Darjeeling into the European country is to be realised. Darjeeling alone cannot be Switzerland. The area can develop as Switzerland if various (tourism) hubs in the region are developed. The NH55 should remain open throughout the year. There is a big need to improve railways and air connectivity in the region and specific projects like beautifying the Mirik lake and the ropeway are to be undertaken. In a word, the possibilities and potentials are tremendous. The point is to translate the dream into reality by conceiving concrete projects. Many apprehended that the tripartite agreement to create Gorkhaland Territorial Administration would give more financial and administrative autonomy to the Gorkhaland stakeholders and thus encourage separatism. But the Eco-tourism policy for Darjeeling is ready. The master plan for tourism development is underway, and once completed and implemented, the region will literally turn into Switzerland. All these will be done under the 'Destination Darjeeling' project. Under the project, all will be done to make the city better from installing street lamps and sign ages on roads, to sanitary development and garbage disposal. Six railway projects have been unveiled, including a modern printing press and basic training centre at the neighbouring hill town Kurseong, a filter manufacturing plant and a multi-functional complex building at Siliguri in the plains. A new line has been set from siligury to Kalimpong via Batasia loop and Ghum. A tourist information centre (TIC) will shortly be set up in the picturesque Mall, the tourist hub of Darjeeling town. A tea tourism festival and an orange festival will also be held, with the former being organised from Dec 20 to Jan 5. Besides, a Rs.28 crore parking lot and a Rs.3 crore stadium will be set up. Air-conditioned buses will soon connect Darjeeling to various important centres. Rs.56 crore will be provided for developing drinking water facilities in the region and establish 100 primary and upper-primary schools.The government will also upgrade hospitals and health centres in the area. An international research centre named after Nobel laureate Rabindranath Tagore and a Nepali academy named after poet Bhanubhakta will also come up at Kalimpong's Mongpu. In addition to the beautification of stations, tourist lodges will be renovated and upgraded. A trekking route will be created from Moniganj to Sandakphu...With private participation, four ropeways would also be installed. The earlier Chief Minister Buddhadeb Bhattacharya dared not go to the hills. But Mamata Banerjee came, saw and conquered. It is another feather in the crown of Mamata Banerjee. The GTA Council will now start functioning as desired by her from the very first day of her in power. During the Left rule the relations with the Hills deteriorated. The demand for a separate land was becoming stronger. “The state government is there with you.” said the elated Chief Minister of West Bengal in the swearing in ceremony to the Gorkha Janamukti Morcha (GJM) which no longer demands the separate state of Gorkhaland. The GJMM movement has led to the loss of hundreds of lives, and has severely affected the region’s economic condition, especially tea and tourism. Now people are hopeful that tourism will be boosted. Peace has prevailed. The CPI(M) is crestfallen at the development in the hills. Darjeeling is on its way to become Switzerland which became an arena for bloodshed and muscle flexing during the Left rule in West Bengal. Mamata magic may turn Darjeeling to Switzerland.